"India Street, from Congress Street, Looking East." India Street, from Congress Street, Looking East. View of India Street, from Congress Street, looking east toward Portland harbor. Northeast corner of India Street and Congress Street, at left. "India Street, from Congress Street, Looking East." (1866). The Great Fire : 1866 - Stereoscopic views. 27. 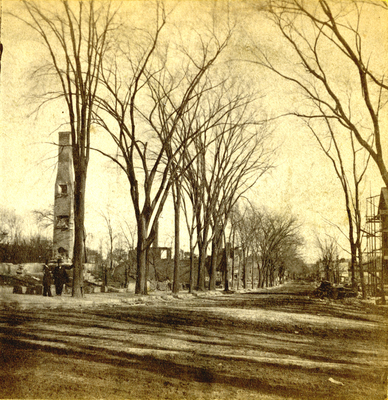 Portland, Me., Great Fire, Portland, Me., 1866, East End, Munjoy Hill, India Street..